Masala Chicken at Malaysia Hala Restaurant on Decatur Road. A samosa at Malaysia Hala Restaurant on Decatur Road. Basil shrimp at Malaysia Hala Restaurant on Decatur Road. 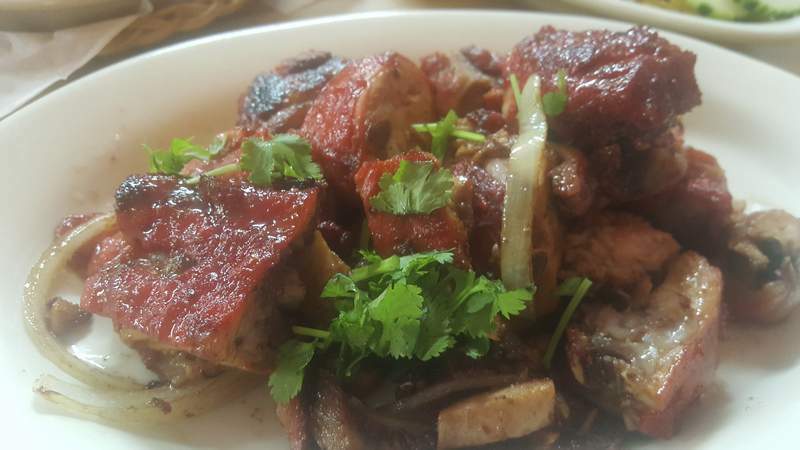 Byriani rice at Malaysia Hala Restaurant on Decatur Road. Shrimp salad appetizer at Malaysia Hala Restaurant on Decatur Road. 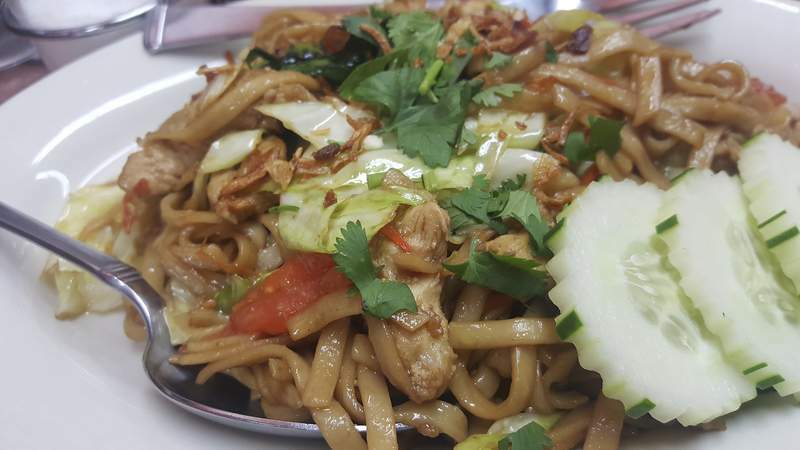 Burmese fried noodles with chicken at Malaysia Hala Restaurant on Decatur Road. Burmese chicken noodle soup at Malaysia Hala Restaurant on Decatur Road. Fried noodles at Malaysia Hala Restaurant on Decatur Road. A Chinese Cruller mix in the Chay Family market where Malaysia Hala Restaurant resides on Decatur Road. Masala chicken ready for serving at Malaysia Hala Restaurant on Decatur Road. The menu board and back entrance to Malaysia Hala Restaurant in the back of the Chay Family market on Decatur Road. Malaysia Hala Restaurant on Decatur Road. A board with Burmese specialties at Malaysia Hala Restaurant on Decatur Road. A falooda dessert at Malaysia Hala Restaurant on Decatur Road. Ramen noodle salad at Malaysia Hala Restaurant on Decatur Road. The first recommendation came from a woman I met at a little Thai restaurant whose job it is to help Asian immigrants get acclimated to Fort Wayne. I figured she's had her share of authentic Asian fare, so I was sure to make a note of it. 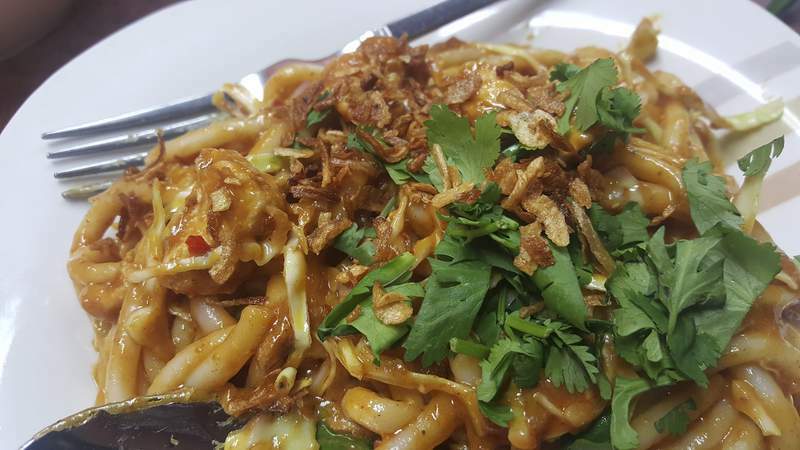 But when the second person who told me about the little Malaysian and Burmese gem hidden in the back of The Chay Asian Market along Decatur Road was the owner of a different Asian restaurant, I knew I had to go. When the competition tells you to check a place out, it must be good. And it was. 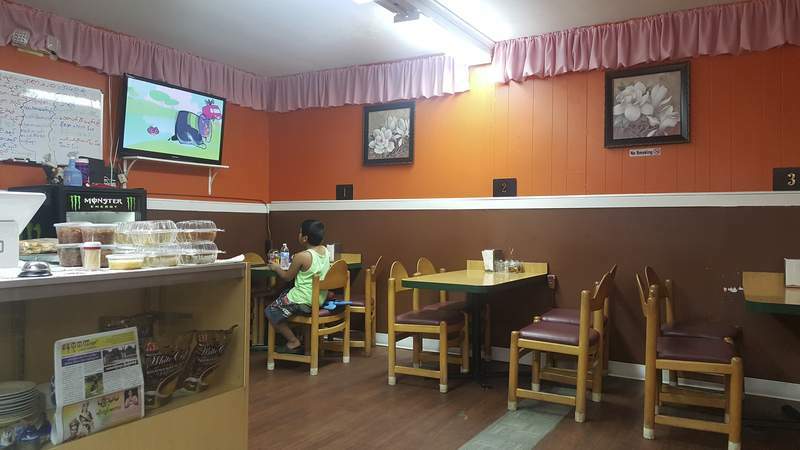 The Malaysia Hala Restaurant recently got a new name – it was called Family Power – and new owners. 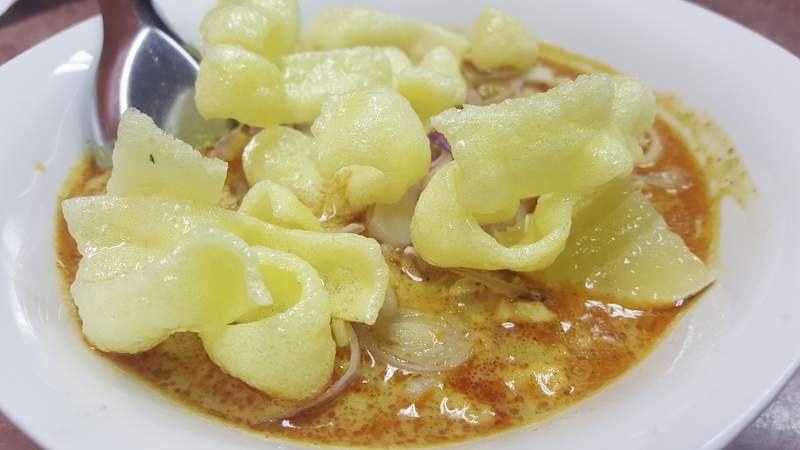 Apparently the woman who was responsible for the food those two tipsters enjoyed fell ill and had to hand the restaurant over to a young couple – he from Malaysia and her from Myanmar – but they were close to her and her menu remains. 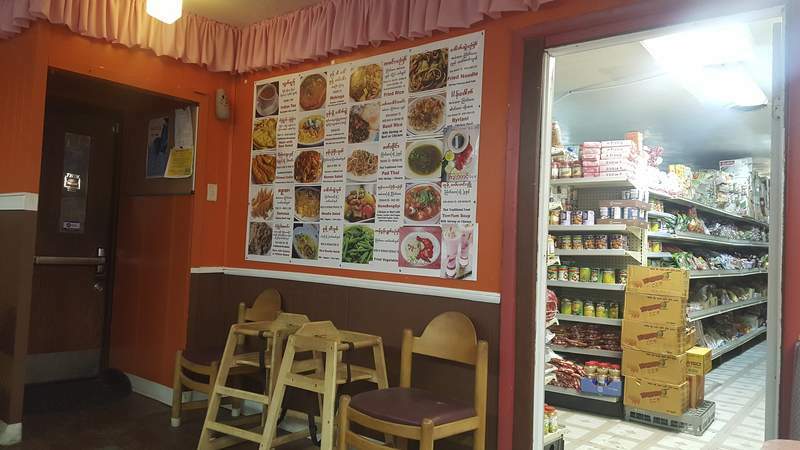 That menu hangs on a wall with large color photos, but there is also a dry-erase board on the back wall with a bevy of specialties the new owners and their chef, a brother, are quite proud of. 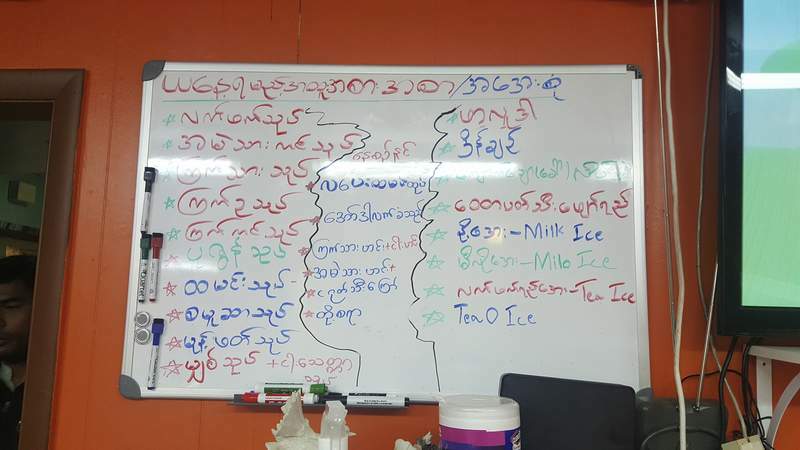 That menu is written in Burmese, however, so you likely won't be able to read it. My first taste was not a mystery. 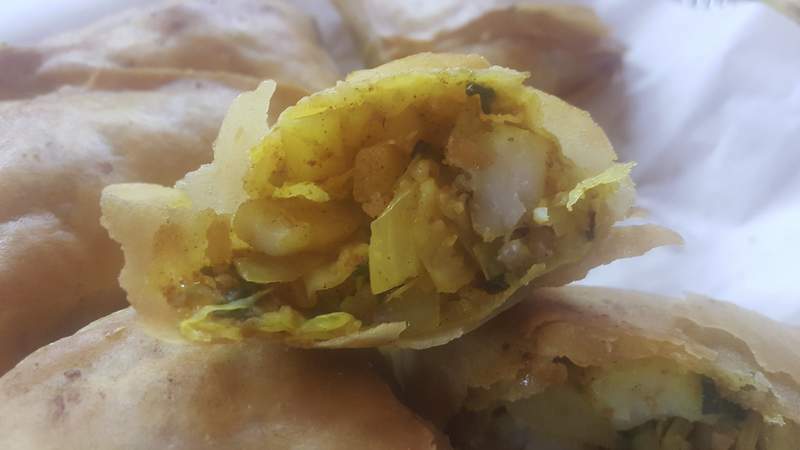 Malaysia Hala's samosas were nearly twice the size of what you usually find, were fried until perfectly crisp and stuffed with a perfect mixture of still-firm potatoes and other vegetables and spices. They are sold by the piece, but make sure you get more than one for your appetizer because you will want more than one. Another appetizer was mysterious because I had never had Chinese crullers before. They were wide, twisted, puffy baked dough strips that were hollow inside, super soft and tender. 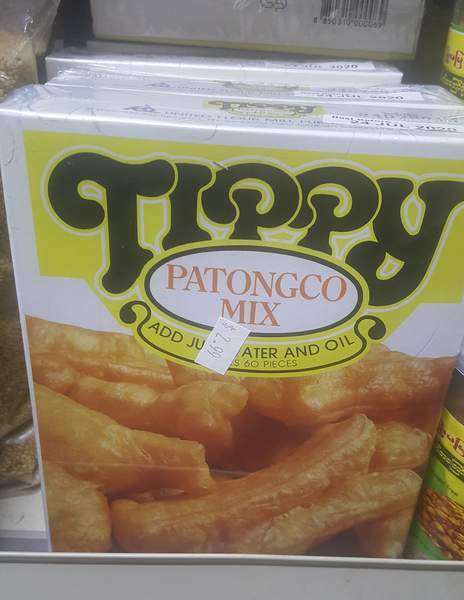 I guess you could call these treats – which are technically dubbed Patongco – Asian breadsticks. They were served with a delicious cup of stewed lentils and broth for dipping, and since they were hollow I delighted in tearing off an end and spooning the yummy lentils inside so I got some in every bite. They were made from a mix sold in the store that the owner gladly showed me in case I wanted to make them myself. The most impressive dish at Malaysia Hala was also a tiny appetizer plate the owner convinced me to try. 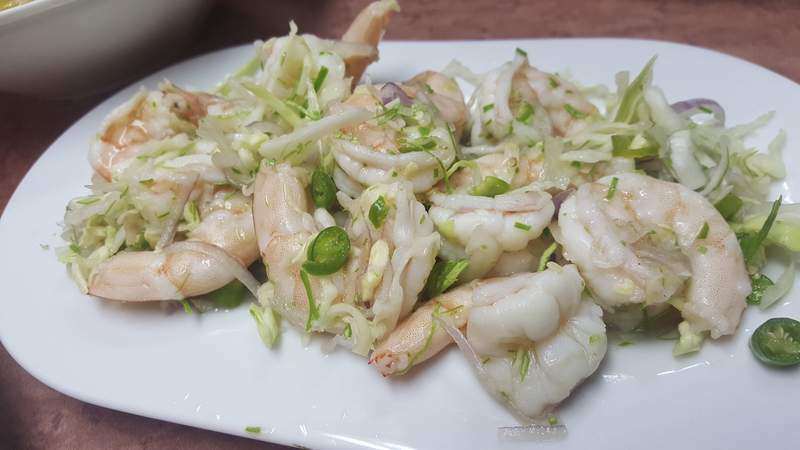 The Burmese shrimp salad came in a beautiful oblong dish and was filled with 10 plump, juicy, super-sweet jumbo shrimp dressed in warm lemon vinaigrette with slightly wilted cabbage, red onions and slivers of green chiles. It was a masterpiece in flavor and texture. Needless to say, any time they wanted me to try something off-menu, I was willing. The Masala chicken was so good I had a hard time not scrapping my responsibilities of diversifying my review and ordering it a second time. The bright red chicken looked much like Indian tandoori chicken, but was way different. It was seasoned with a garam masala spice blend the owner grinds himself and had an intoxicating sweet and peppery – but not spicy – flavor. The rough-cut, bone-in thigh and leg pieces were so moist and tender I was amazed they actually still clung to the bone. Though the chicken came by itself, the Byriani rice, a menu staple, is what I will have as a side with it from now on. 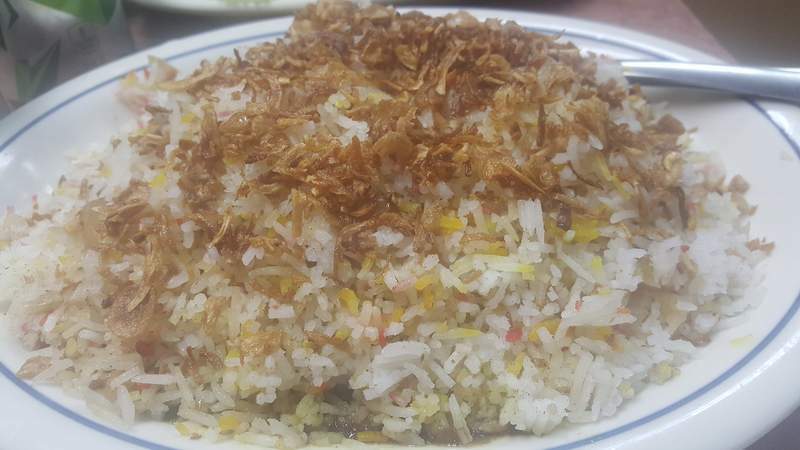 The white, yellow and red-tipped bits of perfectly fried rice included either beef or chicken – a single leg buried under the rice in my case as there was no beef the night I visited – and it was as complex in flavor as it was in color. 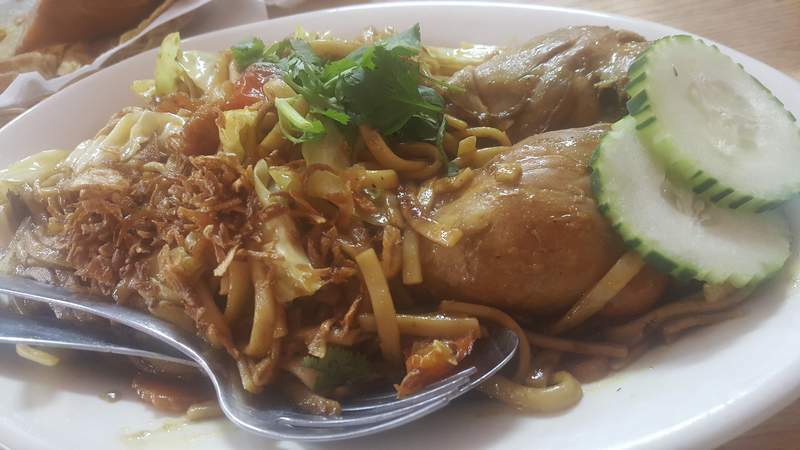 The Burmese noodles with chicken – the last off-menu selection I had – was not as good. The heat of its spices was constant and kept me reaching for water, but the flavor was nice with turmeric giving it a yellow color and carrots, tomatoes and cabbage trying to tame the heat. It was, however, very oily and that oil clung to the flat noodles so I could not eat too much of it. The texture of the Ramen salad also held me back. A cold dish made with thick noodles similar to udon instead of the thin egg noodles most consider as ramen, it looked fiery and I wanted it fiery, so that aspect was welcomed. It was topped with fried garlic and cilantro and had cold chicken bits and raw cabbage throughout. But its base sauce was made with a thick peanut sauce or just peanut butter that coated the mouth with richness. There were also some worthy mainstream dishes. It was not like your mom's, but the “Myanmar traditional” chicken noodle soup was just as comforting. It had a creamy coconut and curry broth that had an even, but not overpowering, spiciness, and it was packed with red onions, garlic, potatoes, a couple of lemon wedges for acidity and rough-cut chicken – watch for bones as I found a few. It also had puffy shrimp chips on top. 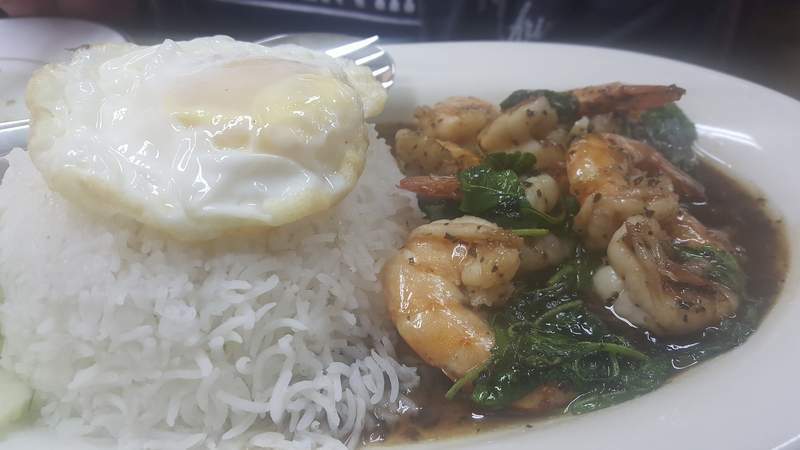 The basil rice with shrimp was the mildest dish and the only one that came with white rice. It also had a runny egg garnish. Again, it was the huge plump shrimp that made this a winner, but the shells were still on which was troublesome. The simple fried noodles were the most basic dish; pretty much what Chinese places call lo mein. It had thick egg noodles, chicken, cabbage, onions, tomatoes and was also topped with fried garlic and cilantro. It had a hearty wok-roasted flavor, was not spicy and had a pleasant slightly sweet and salty flavor. There was a dessert, but it was way too sweet for me. 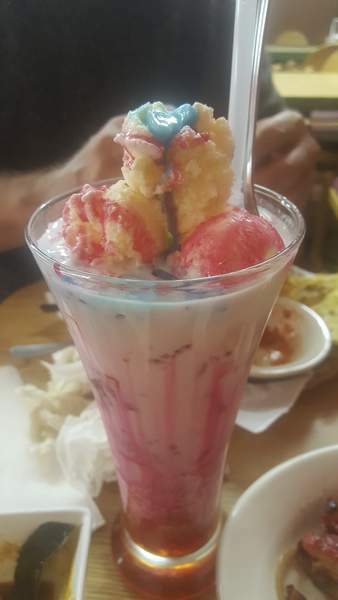 The falooda was a big soda glass layered with ice cream and a variety of brightly colored, sticky-sweet syrups. It looked like a little kid's dream as it was also packed with sweet basil seeds and jelly candies similar to what come in smoothies or bubble teas at other Asian eateries. There were so many jellies and so much sugary stuff I'll pass next time. I would also pass on most of the more basic options at Malaysia Hala. It was clear that the owners are way more excited about their traditional fare and eager to share it. And though it is well off the beaten path – you wouldn't even know there was a restaurant in the back of the store if the door to it was closed – it is pretty rough around the edges and it is not exactly as easy to decide what you want as, say, Chinese take-out, the couple's service was splendid. They really seem to appreciate the business. I sure appreciated them, and those folks who guided me to Malaysia Hala.